Mr Sinha comes from Ranchi, a hill station in Bihar state in India. He graduated from Ranchi Medical School in 1980 and completed his post-graduation in Orthopaedics from Prince of Wales Medical, Patna. He worked in a remote Primary Health Centre in the northern part of Bihar for almost 2 years gaining experience and the confidence to deal with a variety of medical problems including trauma and orthopaedics. He came to the UK in the year 1985 and after completing his Pre-Fellowship rotation in the fishing town of Grimsby, he became a research registrar in Orthopaedics at Walton hospital in Liverpool. 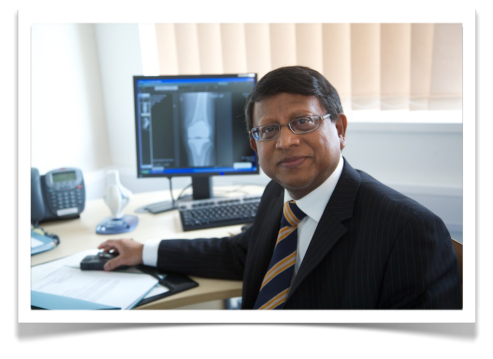 He successively achieved the Masters Degree in Orthopaedics from Liverpool University. His career took him to Dundee as a Plastics registrar and later completed his training in the Manchester Higher Surgical Training programme. He gained valuable experience as a trauma fellow at the University of Tubeigen in Germany. His final years were spent at the Royal Lancaster Infirmary at Lancaster before joining as a Consultant in North Wales at Glan Clwyd Hospital, Rhyl. He established the shoulder and elbow services in the trust. Apart from his clinical services he was involved in education, research and training as well as the management of orthopaedic services in Wales. He has now retired from the NHS. He is engaged only in Medicolegal practice. He remains on the GMC register and has voluntarily given up his licence to practice. Mr Sinha has a son, who has graduated to become a General Practitioner and a daughter, who is at present a Specialist Registrar in Paediatrics. He is a family person and knows where his priorities lie to maintain a fine balance between work and life. He is an avid reader, particularly history books.